At Old Low Moor Farm Cottages we are committed to providing accessible, sustainable tourism to be enjoyed by everyone. Access to the holiday cottages from Moor Road is via the second driveway after the crossroads which is marked “Old Low Moor Farm Cottages” on the sign embedded in the wall. This driveway passes alongside the fishing lake (on the right) towards the stable block. The holiday cottages are on the left hand side, the Mistal being a detached two storey barn and the Granary a two storey house to the right hand side of the Mistal. Two parking spaces are provided for the Mistal visitors, situated immediately behind the Mistal and one space is provided in the next parking bay for the Granary visitors. If extra parking is required there is ample space in the area in front of the stable yard and there is also plenty of room in that area of turn a vehicle. 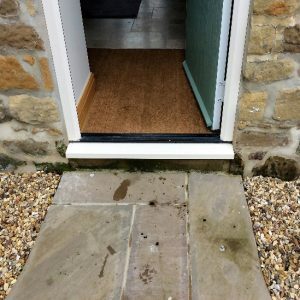 The cottages themselves can then be reached from the parking spaces via a paved, level pathway leading up to the front door of the Mistal and then via a gently sloping walkway leading to the entrance door to the Granary. 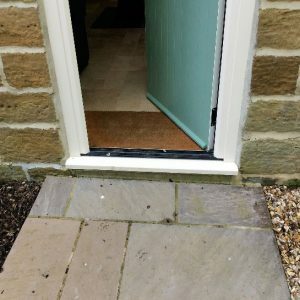 The Mistal has a step into the barn which is 150mm high. The entrance door is 870 mm wide. Once inside the Mistal the ground floor is level with no steps or inclines. There is an open plan living/dining/kitchen with a wood burning stove which is located in the centre of the living area between the sitting area and the dining area. Care needs to be taken when the wood burning stove is lit to avoid touching the pipework or the stove itself which will be hot. There is a double sofa bed in the sitting area which opens out into a standard sized (4ft 6inch) double which is suitable for occasional use. There is a downstairs cloakroom with a standard height WC and wash basin. The doorways leading into the cloakroom are 740mm and 665 mm wide respectively. Please note there is no shower on the ground floor. The first floor is reached via an oak staircase which winds through 180 degrees. The staircase is 730 mm wide and there are 12 steps each 215mm high. There is no lift. A person with significantly restricted mobility is likely to have some difficulty in climbing the staircase. The showers have low profile shower trays which have a “lip” 65mm high. The doorways upstairs are 740mm wide. Once inside the Granary the ground floor is level with no steps or inclines. There is an archway leading from the sitting room into the kitchen/diner which is 850 mm wide. There are no toilet or bathroom facilities on the ground floor. The first floor is accessed via an open tread wood staircase which winds through 180 degrees. 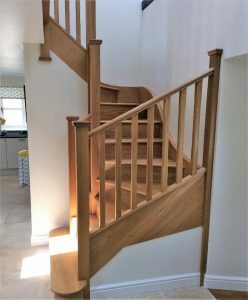 The staircase is 800mm wide and there are 14 steps each 200mm high. There is no lift and again persons with significantly restricted mobility may find climbing the staircase difficult. The bathroom has a “p” shaped bath with a shower over and a shower screen at the shower end. The sides of the bath are 550mm high and there is a grab handle at the back of the bath to assist in getting out of it. The toilet and wash basin are of standard height. There is a fire escape from this floor leading down a straight emergency staircase outside the cottage to the ground. There are 15 steps each 180mms high and there is a metal handrail to the right hand side as you go down the steps. There are several pathways around the cottages which are either level or gently sloping which would be suitable for wheelchairs although care would need to be taken especially on the inclines and in snowy or wet conditions. The courtyard outside the Granary has a raised patio area immediately in front of the Granary and there are two steps leading into the rest of the courtyard. The rest of courtyard is largely cobbled and is therefore unsuitable for wheelchairs. The drive way leading up to the stable yard and ménage is level and suitable for wheelchairs and there are stoned pathways around the stable block and ménage. The area around the fishing lake is grassed. We are in the process of developing two further holiday cottages on site, the Shippen and the Byre. Both cottages will be single storey, the Byre will have one bedroom with an ensuite. 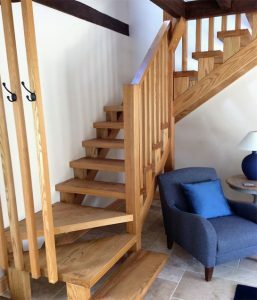 The Shippen is designed to be wheelchair friendly and will have level access into the cottage via a gently sloping ramp. It will have two ensuite bedrooms, sleeping up to five persons. The larger bedroom will have a wet room with a walk in shower with room to turn a wheelchair. All the door ways in the Shippen will be wide enough to allow wheel chair access. It is anticipated the Shippon will be available for letting early in 2018 with the Byre ready for letting by the Spring of 2018.